The community was named after former Mississipian and popular farmer & Methodist minister Alfred E. Farr. Settlement is said to have started in the 1840s or early 1850s. Originally called Farr's Mill, the town seems to have one of each - a grist mill, sawmill and water mill. For good measure there was a cotton gin. The town was on a stageline from Beaumont to Alexandria, Louisiana and during the Civil War the road was a Confederate military trail. The post office was granted in 1875 and the town had a population estimated at 150 by 1875. When nearby Wiergate opened their much larger sawmills in the early 20th century, the sawmill at Farrsville was shut down (1918) followed by the gristmill during the Great Depression. Farrsville's population hovered at 75 throughout the first six decades when, in the mid 1960s it doubled to 150. 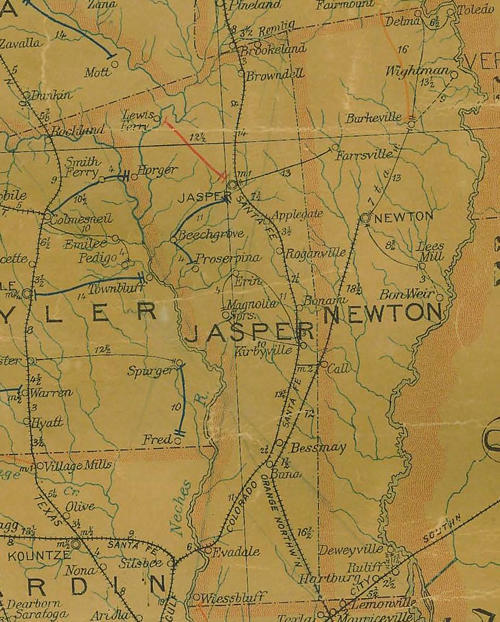 The TxDoT map of Newton County shows three cemeteries within two miles of Farrsville. Hines, Pleasant Hill and one with no name shown.